For the last five years, I’ve struggled with wrist pain. Multiple trips to doctors years apart yielded no results–they just told me to put some ice on it and take Ibuprofen, even when I told them I’d already tried that. The response was something along the lines of “well, go home and try it some more”. Well, after years of jumping through hoops, I joined up with a health clinic–on a quest to get the free dental service for youth offered there–and lo and behold, the doctor there realized I have a serious problem and sent me to a hand clinic. The hand specialist decided I have tendonitis instead of carpal tunnel (what a relief *rolls eyes*) and sentenced me to wearing a splint on my left wrist for a month. Now, I’ve dealt with pain in my wrist for years. I’ve had several one or two month periods where I didn’t do anything more than homework and blogging–and occasionally not even blogging–to soothe my wrist. Although the pain has grown more consistent over the years, I’ve kept the worst of it away through ice, stretches and occasionally painkillers. I’ve managed to slow down, if not reverse, the progress of the tendonitis. It took four and a half years to go from occasional searing pain to daily pain. Although it is helping with the pain, wearing the splint in some ways is worse. I am left handed and being unable to write with pen has completely undermined my brainstorming, plotting and scheduling. I created my daily to-do lists on paper. I created my worlds on paper. I planned my novels, short stories and even blog posts on paper. Having to do without is crippling. Since putting the brace on, I’ve felt depressed and uninspired. I’ve stopped carrying a notebook for the time being because I can’t use it. While I’m glad they’re taking my problem seriously now, I’m angry because they chose the worst possible time to put my wrist in a splint. I’ve spent this whole summer trying to create a writing income–with minor success–and edit Moonshadow’s Guardian. The week before the splint my computer caught a virus, paralyzing my work for two days. Right when I got back into the groove, they put the splint on me. Now I’m barely more than halfway through Moonshadow’s Guardian with only a week left before school. My non-fiction has slowed to a trickle, and I haven’t been sending out queries. Why? Because without paper to brainstorm on, the ideas have slowed almost to a stop. On top of that, everything takes longer and I’m both depressed about it and worried about time constraints. What I have managed to do is continue editing Moonshadow’s Guardian. I edited eight or nine chapters last week. I already know exactly where this edit is going, so I can still forge ahead–although I now spend longer getting into the writing zone. I can type with both hands still, but my left is slower and I can’t do it for too long without causing pain(I probably shouldn’t be typing with my left at all, but you try typing with one hand–it’s impossible unless that hand’s tied behind your back). The worst part about all this? I know if I was up to speed I could finish my editing before school starts next week. In my current condition, I probably won’t finish until the end of September. Dealing with tendonitis is a long, difficult journey. It’s easy to get depressed, and frankly I can’t give you advice to stay out of depression. But I can give you advice to get through it: focus on the idea that one day you won’t be in pain anymore and you’ll be able to use your hand, scale back on your writing and get lost in other people’s books. It’ll give you something productive to do with all that time you spent reading and maybe even take you to another planet. Next Friday I’ll be finding out whether or not I can take the thing off, so stay posted. Today I’m very pleased to be introducing C. Hope Clark, author of Lowcountry Bribe and founder of FundsforWriters.com, where she runs three free newsletters and one paid newsletter. Her newsletters contain inspirational articles and quotes alongside information about grants, markets and job opportunities in the writing world. I’ve been subscribed to all her free newsletters for several years. She’s even published one of my articles in WritingKid and agreed to publish a second article in the Funds for Writers newsletter, which I’m told will be released later this year. 1. Can you tell us a bit about your book, Lowcountry Bribe? 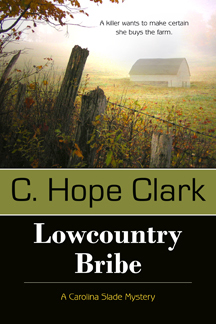 Lowcountry Bribe by C. Hope Clark is the first in the Carolina Slade Mystery Series. Set in South Carolina, particularly along the coast in Charleston County, Lowcountry Bribe introduces readers to Carolina Slade, a smart, focused, sometimes over-thinking woman who feels safe in the bureaucratic world of the U.S. Department of Agriculture . . . until she’s offered a bribe . . . from a hog farmer, no less. Slade follows proper protocol and reports Jessie Rawlings to her superiors. The next thing she knows, Slade is besieged by Senior Special Agent Wayne Largo from the Office of Inspector General in Atlanta. He and his partner have come to investigate Slade’s accusations, and if possible catch Jessie in the act of handing over money. While the situation disrupts her life, Slade reminds herself that following the book in reporting the incident was the right move. However, events do not go smoothly. The IG isn’t telling Slade everything. The agents are also investigating the disappearance of Slade’s manager the year before in connection to possible land fraud. And when the sting on Jessie goes bad, the case is put on hold and Wayne is recalled to Atlanta, leaving Slade exposed and vulnerable, fearing not only for her life and job, but for her children’s safety. 2. When did you first realize you wanted to pursue writing as more than a hobby? When I was burning out as a federal government bureaucrat and escaping at night to write. I’ve written all my life, and my writing ability helped garner a couple of my promotions. But I’d reached a relatively high position that was political, and I decided life was too darn short. I asked for an early retirement to write, and at 46, I walked out and began writing for a living. I’d written the first draft of Lowcountry Bribe and started FundsforWriters three years earlier, which I had managed part-time. So it took being fed up with the day job to tackle writing as a career. I never looked back. However, disclaimer ahead, I made sure I had health insurance, an emergency fund, and most debts paid in full. I also packed up and moved cross country so my husband could take a promotion to help cover my loss of income. My writing was a family decision and continues to be a family affair. 3. Why did you create the Funds For Writers newsletters and how have they helped build your writing career? FFW was accidental. I started it to keep from answering so many emails. I was already freelancing online as a hobby back in the 1990s, and a local writers’ group asked me to speak about writing for the Web. The chat turned into complaints about writers earning a living, so I helped advise them on the spot. You see, I knew loans and grants and budgets from working with the federal government. The newsletter grew without my trying. Two months – 200 members. Six months – 1000 members. Today – 45,000 members. Of course the notoriety of being selected by Writer’s Digest’s 101 Best Websites for Writers each year for the past 12 years has tremendously helped my platform. Between that, my freelance work, and my speaking engagements, I’ve been able to make FFW thrive. And that reach has helped sell my mystery, Lowcountry Bribe. However, while FFW was accidental in origin, it became precious to me as I realized how much it aided new and mid-level writers. I can’t count the hundreds of thanks I’ve received over the years. It’s so darn rewarding, and it not only keeps me excited, but it also keeps me up to speed on what’s happening in the industry. It has connected me with people who have assisted my own writing career. It’s just a darn good networking tool, in addition to being a great tool to aid writers. 4. What advice would you give to someone trying to start a weekly newsletter? Pick a theme that POPS. Nothing milk toast. Nothing average. Have a unique idea. Then decide how it will be eye-catching and useful. Then be very consistent with its delivery. In 13 1/2 years, FFW missed two issues – once when I was moving cross country and another when I was in Europe. That’s a lot of Fridays where I delivered come hell or high water, and the readers appreciate it. Consistency can make or break you these days with so much competition. 5. What have you learned through managing Funds For Writers that you’ve been able to apply to fiction? Let’s see . . . I found contests to enter, which placed my fiction manuscript in the eyes of people, to include agents. My agent signed me up partially because of my earned awards. I’ve learned of freelance markets which I’ve pitched and won. I’ve been invited to innumerable events to speak and sell my books. FFW has been a bridge for me, teaching me the markets, publishers, agents and opportunities for fiction writers. I not only use them myself, but I pass them on via social networking and the newsletters to other writers. Those writers often buy my fiction. It’s just a great cycle. But also, writing so many editorials for FFW newsletters improved my writing 100-fold. I changed my novel to first person simply because I’d honed that perspective so well via my editorials in FFW. 6. When and how did you first come up with the ideas for Lowcountry Bribe? Lowcountry Bribe started with a bribe offer to a federal employee. I was that employee once upon a time and was offered a bribe. It was hair-raising and stressful. However, the real event wasn’t as dangerous as a mystery commands, so after the bribe offer, I took off with pure fiction and had a ball making up the obstacles for my heroine.The bribe offer was twenty years ago, but I brought it up to speed with technology and made it a suspenseful story. Once I established the characters, the subsequent story was just plain fun. I hate the first draft. Most writers love that part and hate the editing. I’m the opposite. The first draft is like running through mud. However, when I sit down to write fiction, I do not get out of the chair until a chapter is written. Doesn’t matter what time it is. I’m a night owl anyway, but I’ve often written until 3 and 4 in the morning because I was not quitting until I’d ended the chapter. Not sure that’s easier in any way, but it’s what I do. It’s a driving force to reach the end so I can enjoy the edits. 8. Have you ever considered writing fiction in a genre other than murder mystery? I tried romance shorts for a while. I lost interest. I love the plotting, innuendo, red herrings and double entendre of mystery. I love pitting story against reader, in a genre where the reader is trying to guess the end and out-think the author. I rarely watch movies other than mysteries or suspense. Love that challenge. Why change? Fight not only to write daily, but to write BETTER daily. If editors aren’t buying your work, you’re doing something wrong. We too often try to argue with that truth. Keep struggling to improve until someone bites on your manuscript. Never stop tweaking. 10. What are you working on now that readers can look forward to? I am about to enter edits for Book Two of The Carolina Slade Mystery Series and it’s expected out first quarter of 2013. I’m finishing Book Three’s first draft. I’m also trying to outline a new series to run parallel to The Carolina Slade Mystery Series. It’s in very raw stages at this point, having just spoken to the editor about it this week. Then there’s always a nonfiction book I’d love to complete, that’s 40 percent done . . .of course I write on it when the fiction doesn’t interfere with its editing and writing deadlines. In other words, I’ll write fiction until I can no longer write. Never a dull moment, that’s for sure! C. Hope Clark was born and reared in the South, from Mississippi to South Carolina with a few stints in Alabama and Georgia. The granddaughter of a Mississippi cotton farmer, Hope holds a B.S. 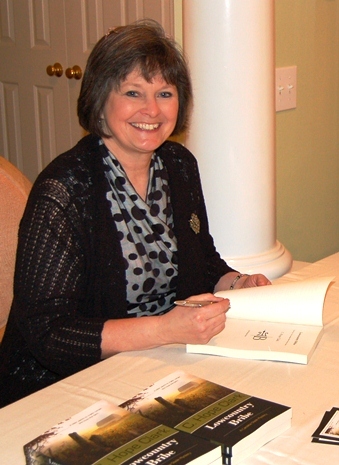 in Agriculture with honors from Clemson University and 25 years’ experience with the U. S. Department of Agriculture to include awards for her management, all of which enable her to talk the talk of Carolina Slade, the protagonist in most of her novels. Her love of writing, however, carried her up the ranks to the ability to retire young, and she left USDA to pen her stories and freelance. Lowcountry Bribe’s opening chapter took first place in the Phillip Mangelsdorf Award, third place in Alabama Writer’s Conclave Competition and honorable mention in The Writing Show Chapter Competition as judged by bestselling mystery author C. J. Box. The chapter also made finalist status of the Daphne du Maurier Award for Excellence in Mystery/Suspense sponsored by Romance Writers of America. The novel enjoyed semi-finalist status (top 100 out of 10,000) in the 2009 Amazon Breakthrough Novel Contest. Last Friday I was officially diagnosed(after jumping through several hoops over several years) with tendonitis in my left wrist. For the next few weeks I’ll be wearing a splint day and night, slowing down my work speed and completely eliminating hand writing possibilities. It’s taken me several days to get the courage to write this post. While I’m happy the healthcare system is actually taking my issues seriously, I’m severely depressed about not being able to write by hand. I’ve also realized that if I stand even the slightest chance of having finished this draft of Moonshadow’s Guardian by the end of the summer, I need to focus more on that. I’m also working on a handful of paid projects that will now take more time to complete. The bottom line is that I don’t have time for everything on my plate now that I’m being forced to work more slowly. Without pen and paper, even the creation of ideas is much slower. And as much as I love this blog, right now I feel my other projects are more important to my career in the long run. So I will be going on official hiatus until I’ve been freed from the splint. Not that I’ll be disappearing completely. I have a few interviews planned for the next few weeks including one with Hope C. Clark of Funds For Writers. I’ll also be giving semi-regular updates on my progress with the tendonitis. I just won’t be able to maintain my usual schedule of posts. I hope you can understand the decision I’ve made and will check in with me to stay updated on when things will be able to get back into full swing here at Dianna’s Writing Den. Since I’ve spent the last the weeks on a non-fiction kick, and more importantly since my entire database of markets was wiped off my computer, this week’s markets are all for fiction. Today’s markets are new and don’t pay much, but they caught my eye for varying reasons. The Epiphanist pays $.02 per word up to 8,000 words for short fiction. They also accept serial fiction with no stated word limit. What about this magazine caught my eye? I love the name and upon reaching the site, the pictures are breathtaking. They’re not going to make you rich, but wouldn’t it be nice to see your work beautifully illustrated? Plunge Magazine caught my eye because they only accept stories involving queer women. They can only pay $15 for short stories of up to 5,000 words, but it’s the only magazine themed around queer women that I know of. Go team. TM Magazine I checked this one out because its name seemed odd to me, and discovered that they pay $0.05 per word for both short stories and novellas up to 60, 000 words. What’s the catch? No matter what you’re sending them, they want a pretty complete submission package. Metro Moms: Metro Fiction is a fiction extension of Metro Moms, a site I’d already come across in my web adventures. On this trip I discovered that they’ll pay you $25 for a short story of 900-1100 words that will appeal to its large audience of women. They accept all kinds of genres. If you think you’ve run out of markets, never fear–magazines go up and down all the time. By the time you’ve been through all the markets you knew, there will be half a dozen new ones springing up. Maybe even more. Have you found any other interesting markets lately? Share them in the comments. This week I’m participating in the Cora Flash tour run by novel publicity. 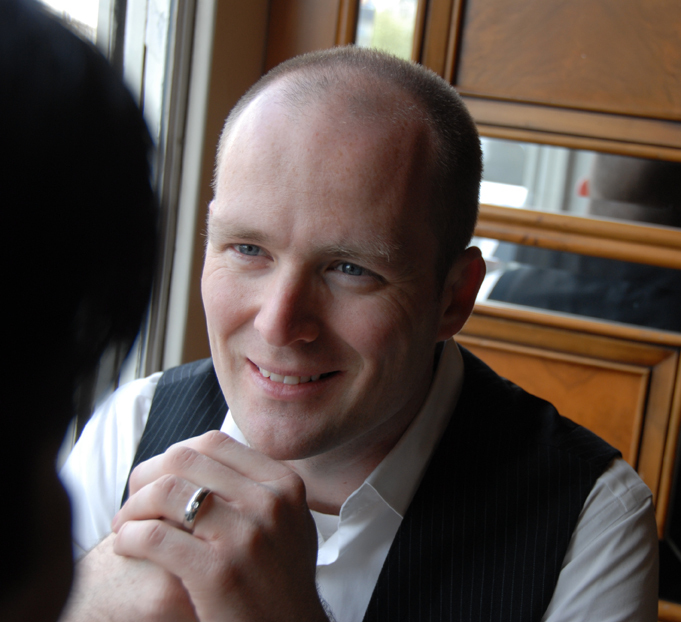 I’m pleased to introduce Tommy Davey, author of middle-grade novel Cora Flash and the Diamond of Madagascar, the first in a planned series of Cora Flash novels. It’s a nice change of pace as I rarely interview middle-grade authors. There’s also a contest with all sorts of prizes, which you’ll find at the bottom of this post. 1. Can you tell us a bit about your book, Cora and the Diamond of Madagascar? 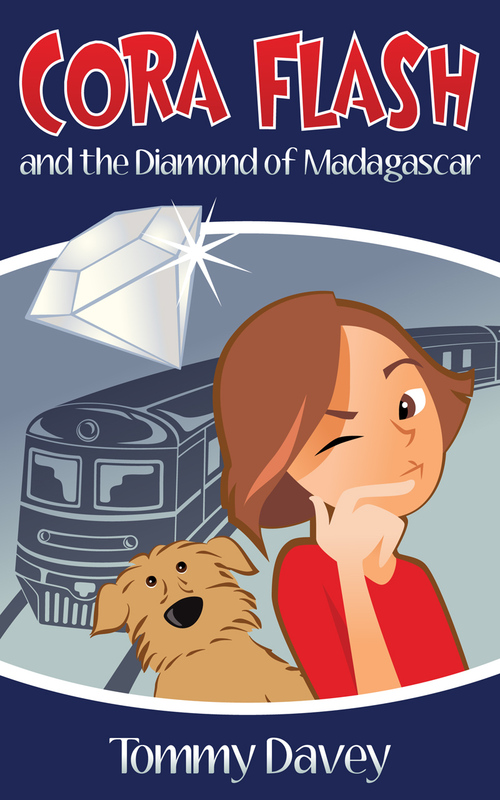 Cora Flash and the Diamond of Madagascar is the first book in a new middle grade mystery series. In this book, Cora is travelling cross-country on a train to visit her Uncle in the mountains. Once on board, Cora discovers a very valuable diamond is being transported to the mountains – but it vanishes soon after the train departs. There is an inspector on board, but Cora starts an investigation of her own to discover who stole the diamond – she even picks up a sidekick along the way who will be a large presence in future books. 2. When did you know you wanted to pursue writing as more than a hobby? I have always known this, but it takes some serious discipline to get down to business and put in the time and effort that it takes to devote to writing and promoting. I still have a full-time job outside of my writing, but now find my ‘downtime’ is far more enjoyable when I pursue my passion. 3. What made you decide to write middle grade fiction? There was no one thing that made me decide to write middle grade. I started with a plot and developed it in my head and by the time I was ready to start writing, it had become a middle grade story. I had been rediscovering middle grade fiction recently, so I’m sure that greatly influenced my decision. 4. Did you find it difficult writing first person narrative in the voice of Cora, a young girl? Interestingly, my first draft was written in third person. When I was in the review/editing stage, there was something that just was not working. I couldn’t put my finger on it, but eventually realized the story needed to be told from Cora’s point of view. I rewrote the entire story from her perspective and it made all the difference in the world. I hope that readers will think I have accurately captured the voice of a young girl, but the more I write in her voice, the clearer her voice becomes. 5. What does the editing process look like for you? I made a rule to not stop writing the first draft until I was all the way to the end of the story. At that point, I usually read the entire manuscript and start making notes on the pages, everything from grammatical errors, structural flaws or things I have forgotten altogether. After a full pass, I print it off and give it to someone else to review. Luckily, I have someone who is a very sharp-eyed editor and I get great notes and suggestions from him. Having a second set of eyes makes a tremendous difference. 6. What is the hardest part of the writing process for you, and how do you make it easier for yourself? The hardest part is discipline, no doubt about it. Once I get going, I am very productive, I can go a few solid hours of writing and knock out a few thousand words. I just have to put my blinders on and ignore the phone, tv and especially internet. It can be tricky, but once I get going, I stay on the course. When I was very close to the end of Cora, I actually booked a train ticket for a city about 2 hours away and wrote on the train to put me in the right frame of mind. I checked into a hotel and wrote well into the night. The next morning, I finished the book on the train ride home. It was a bit of an expensive exercise, but I wrote the final third of the book in that space of only about twelve hours. 7. Who are three authors you admire and why? In the middle grade world, I love Enid Blyton who is not as well known in the US as she is in the UK and Canada. Her books always had a lot of adventure and excitement, which I think are key to capturing the middle-grade audience. Second on my list is Nancy Springer, who writes a terrific series featuring a character called Enola Holmes, Sherlock Holmes’ younger sister. I think it was a risky move to write a young adult mystery series that is set in Victorian England. I am sure the publishers worried that it wouldn’t find an audience, but they have a very loyal following and are beautifully written. They’re great stories and should be on every parents gift list. The other name I will give is Daniel H. Wilson. He wrote Robopocalypse and most recently Amped. Normally, I don’t read science fiction, and would not typically give a science fiction author as an example of one I admire. However, Daniel has made his books accessible for people who would not normally read his genre, and that is a tremendous achievement. Any author who can write a story that is so compelling in of itself that you transcend the genre is a gifted writer. To turn readers on their head and make them look at something that they would typically ignore is an amazing accomplishment. 8. What’s the scariest thing about releasing your debut novel? My biggest fear, of course, is that no one will buy it! Or worse, people DO buy it and give it bad reviews! Luckily, I am building my audience and the reviews I have received have all been very positive. I’m sure there will be some negative reviews to come, particularly as I build out the series, but it’s nice to know that so far everyone seems to really enjoy Cora. The most important piece of advice is also the simplest: Write! It’s so easy to get distracted with other things, particularly for those who are self-published. There are so many social media platforms that seem to be begging for updates and writers boards and sites that scream to be read, but all of these things take away from the actual process of creating. Setting a schedule of writing, and just writing, is tremendously helpful. Blocking out all of that other stuff will get you back to the task of actually writing. I have just released the second book in the series, Cora Flash and the Mystery of the Haunted Hotel, and I think it is a great follow-up to the first book. It picks up right where the first book leaves off, you can go right from one to the next. The adventure level has been brought up a notch and there are some pretty interesting characters kicking around in that story, I’m very proud of it. I have just started to plot the third book, and plan to release it in November, just in time for the Holidays! Leave a comment on my blog. One random commenter during this tour will win a $50 gift card. For the full list of participating blogs, visit the official Cora Flash tour page. Enter the Rafflecopter contest! I’ve posted the contest form below, or you can enter on the tour page linked above. Tommy Davey spent his youth writing mystery stories and plays, and watching reruns of Three’s Company until every line of dialogue was permanently burned into his memory. When not writing, he enjoys traveling to favorite destinations including New York City and Paris, which he plans to feature in future stories. He lives in Toronto, where he was born and raised, with a Norfolk Terrier named Calvin. “Cora Flash and the Diamond of Madagascar” is his first novel. Connect with Tommy on his website, Facebook, Twitter, or GoodReads. Get Cora Flash and the Diamond of Madagascar on Amazon or Barnes & Noble. Write something involving a deadly virus. It could be a computer virus that wipes out computers… or takes control of someone’s life support systems. Maybe it’s a magic plague. The boy on her arm had the look of a Vonstone, but not much strength to him. Red hand marks ringed his neck. His eyes were sunken and tired, fixated on Rolf’s beautiful fur. Please share your favourite sentence (or two) in the comments below.